Magnificent Maleficent Wings « Adafruit Industries – Makers, hackers, artists, designers and engineers! Disney’s live-action Maleficent inspired several cosplayers to dress like the villainous sorceress. I’ve seen every outfit of Maleficent’s in the film replicated, but this take from cosplayer Lopti, also known as nomokis on DeviantArt, is my favorite. She’s dressed as Maleficent before the fairy lost her her wings. 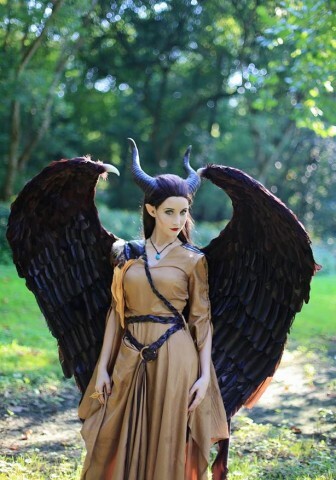 She worked with others to pull the costume together: Boci Art made the horns, the contacts are from Samhain Contact Lenses, the elf ears are from Aradani Studios, and Firefly Path crafted the stunning wings. 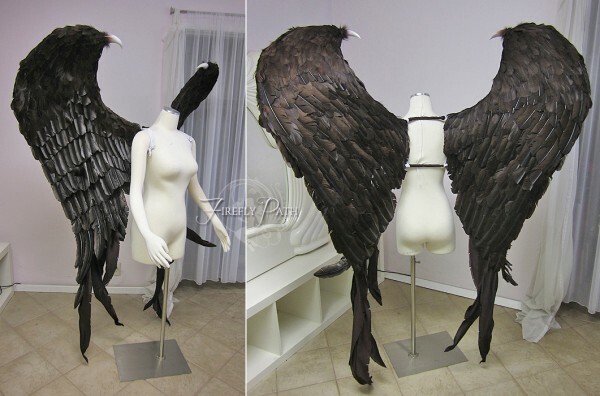 We created these Maleficent wings for cosplay customer Some Like It Blue with 220 custom dyed quills and 6 pounds of feathers. Plastic claws sprout from the tips of the wings. Since super long quill feathers don’t exist we made fabric & wire feathers for the bottom. They’re definitely the most eye-catching piece of the ensemble.